The Advanced Mini-Mini Chuck is simply the most effective product for reduced diameter machining or components and applications where confined access or tight spaces can prove problematic. Designed as a mechanical alternative to both hydraulic and shrink-fit products it features an 8 degree collet and no external nut. This allows the chuck to be not only extremely compact but also provide gripping capabilities and performance characteristics surpassing those of the competitors. 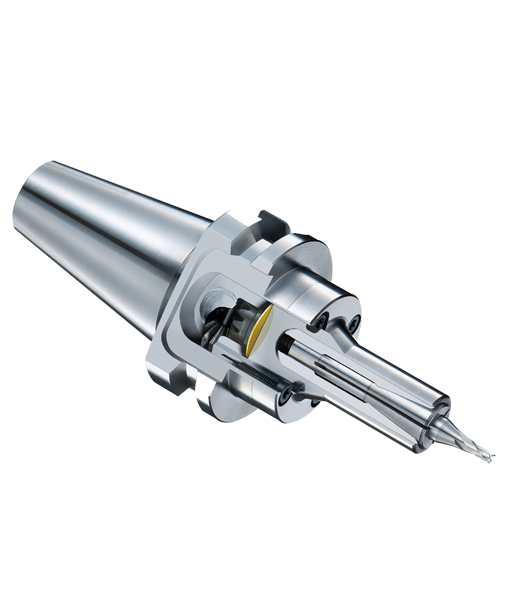 The Mini-Mini is a balanced system offering superior performance and accuracy at up to 30,000rpm (G2.5). The collet, because the design features no external nut, is actually drawn from the rear using a 90 degree bevel gear system which allows tightening from the side of the holder. Improved 'sliding effect' lowers friction due to surface hardness of the TiN bearing (HV2,200). Reduced internal corrosion for longer life and improved cutting performance - the uncomplicated design allows better balance improving surface finish and run-out accuracy. Better contact between nut and collet results in less vibration and therefore improved accuracy and performance. Available as standard on Nikken 2-Lock for both BT and DIN tapers the Advanced Mini Mini Chuck also offers the benefits of dual contact for both flange and taper on suitable machine tools (2-Lock is also fully compatible with standard BT/DIN type spindles). 2-Lock increases the contact area considerably from around 44.4mm to 63mm (BT40) and also, as with all our NC tooling products, provides users with over 80% taper contact as standard. Additional standard options of course also include HSK tapers.